We live in mango land. Our house is in the midst of mangos orchards. We also have a few trees. But we don’t use chemicals and our mangos are eaten by the bugs. We don’t mind; we like beetles and butterflies. So we buy our mangos. But this week we didn’t have to buy them, our neighbors gave us a few kilos. For our neighbors I placed 7 buns in a spring cake form to make a flower of buns and the other 2 buns are our hamburger buns for tonight. The neighbors liked the buns and we too. That evening we had our own hamburgers on these soft buns. 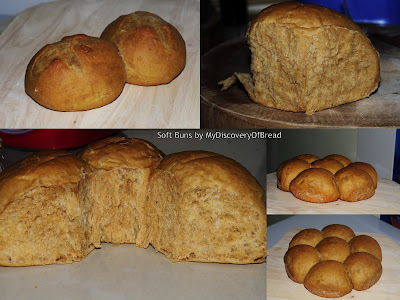 I still prefer crusty sourdough buns, but these are good soft buns. I don’t like the smell and the taste of molasses in our bread. Since I found roasted malt I don’t use molasses anymore in bread. But, I followed the recipe (except for the flour) thinking; ‘if they use molasses in this roll at the SFBI, I should try it too’. We still use molasses in the garden and our cats likes it too. The evening before I made the prefermented dough by mixing all ingredients in a bowl until the dough was smooth. This takes a few minutes. Covered the bowl and placed for 1 hour in the kitchen and then in the refrigerator for the night. On baking day add all dough ingredients in the mixing bowl (use 80 grams of water) and add the preferment in a few pieces. Mix on low speed until the ingredients are incorporated. This takes about 4 minutes. Add water as needed to give the dough a medium-soft consistency. Mix until you see full development of gluten. If you take a piece of dough and gently stretch it till you can see trough, without any bits of thicker dough. Cover and let ferment for 1 hour. Place the dough on the counter and divide it into 100 gram pieces. Degas the pieces and shape into a tight ball. Pull all sides of the dough together and place it seam side on the un-floured counter. Cup your hand over the ball and gently pressing the dough to the counter, you feel resistance from the counter. This will close the seam and your hand will make a perfect ball. Place the buns on parchment paper and proof for about 1,5 – 2 hours. Check your dough. Press your fingertip on the dough, when you pull back you see the dough spring back very slowly. This means the dough has proofed enough. When the dough fills the imprint of your finger fast, it’s not time yet. In the mean time pre heat the oven to 190˚C. These buns like some steam; place the baking pan with stones and water at the bottom of the oven. Bake for 8 minutes with steam, and another 8 – 10 minutes without steam. Until the buns have a nice color.